Here’s a project I’ve been working on which kind of started on a whim a few days ago. I’ve had two NJQRP DDS Daughtercards lying around, the older versions without the output amp update. I decided to interface one permanently to an Arduino and build a dual 10 and 6 meter beacon. Is your lab as messy as mine? The Arduino alternates the DDS frequency between 28 Mhz and 25 Mhz and CW keys the amplifier board. For the six meter transmitter chain I’m doubling the DDS 25 Mhz output to create the 50 Mhz six meter signal. Output power on each band will probably be around 250 mW. I’m probably going to put the unit in a weatherproof box, install it in the backyard, and attempt to power it with solar power. In addition to doing the CW keying and DDS programming, the Arduino will also measure and announce the battery voltage and perhaps the solar panel charge current. For antennas I’m thinking of simple wire loops. Several years ago I ran a 100 mW ten meter beacon. I like lower power beacons; it’s more of a treat when people report hearing them. The previous ten meter beacon got quite a few DX reports from Europe during the last solar cycle. Thanks for your note and interest, Chad. I’m hoping to get some code and schematics posted soon. Unfortunately work and business travel has been eating up my time lately. 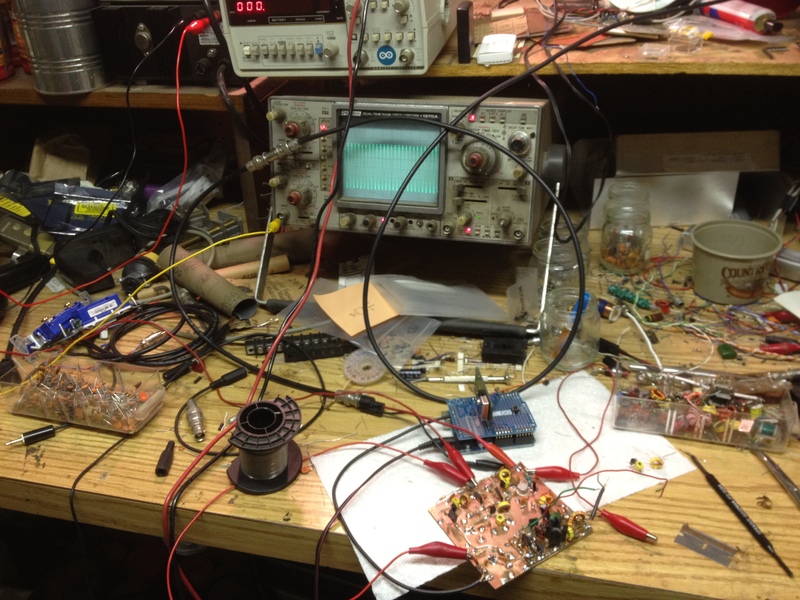 Both the 10m and 6m transmitters are working and I’m working on getting the Arduino interfaced. I’ve been working on the Arduino code that’s based on my keyer code, but it has a full state machine design which I may back port into the keyer code at some later date if I get the motivation and time.